Maybe you expect navigation lamps to fail. After all, seaworthy vessels rock, shake and vibrate—and how much punishment can a lamp be expected to take? 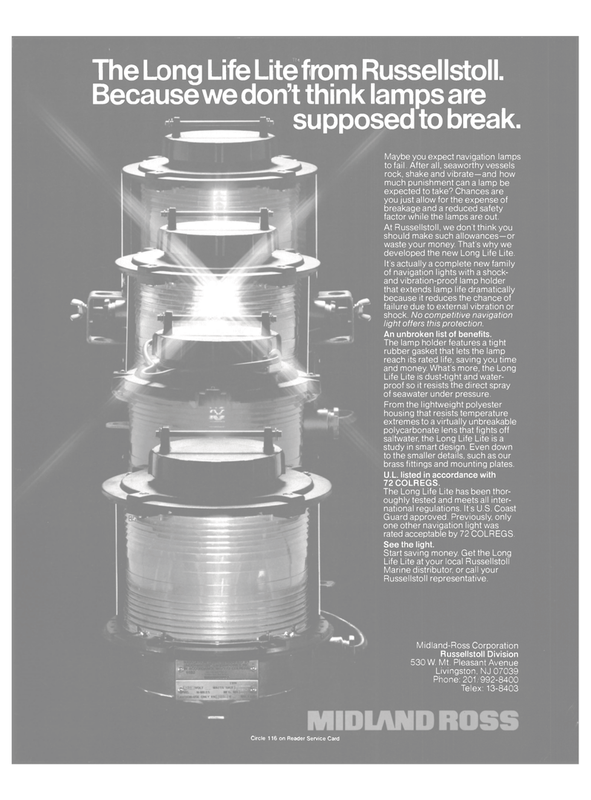 Chances are you just allow for the expense of breakage and a reduced safety factor while the lamps are out. At Russellstoll, we don't think you should make such allowances—or waste your money. That's why we developed the new Long Life Lite. It's actually a complete new family of navigation lights with a shock- and vibration-proof lamp holder that extends lamp life dramatically because it reduces the chance of failure due to external vibration or shock. No competitive navigation light offers this protection. An unbroken list of benefits. Life Lite is dust-tight and water- proof so it resists the direct spray of seawater under pressure. From the lightweight polyester housing that resists temperature extremes to a virtually unbreakable polycarbonate lens that fights off saltwater, the Long Life Lite is a study in smart design. Even down to the smaller details, such as our brass fittings and mounting plates. U.L. listed in accordance with 72 COLREGS. Guard approved. Previously, only one other navigation light was rated acceptable by 72 COLREGS.